Louisville is located on the south bank of the Ohio River, 604 miles below Pittsburgh, Pennsylvania, and 377 miles above the mouth of the river at Cairo, Illinois. The city is divided by Beargrass Creek and its south fork into two portions with entirely different types of topography. The eastern portion is rolling, containing several creeks, and consists of plateaus and rolling hillsides. The highest elevation in this area is 565 feet. The western portion is mostly flat with an average elevation about 100 feet lower than the eastern area. Much of the western section lies in the flood plain of the Ohio River. Nearly all of the industries in the city are located in the western portion, while the eastern portion is almost entirely residential. A range of low hills about five miles northwest of Louisville, on the Indiana side of the Ohio River, present a partial barrier to arctic blasts in the winter months. During colder months, snow is frequently observed on the summits of these hills when there is no snow in the city of Louisville or in riverside communities on the Indiana side of the Ohio River. 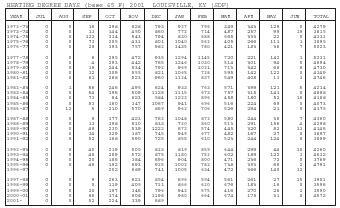 The climate of Louisville, while continental in type, is of a variable nature because of its position with respect to the paths of high and low pressure systems and the occasional influx of warm moist air from the Gulf of Mexico. In winter and summer there are occasional cold and hot spells of short duration. As a whole, winters are moderately cold and summers are quite warm. Temperatures of 100 degrees or more in summer and zero degrees or less in winter are rare. Thunderstorms with high rainfall intensities are common during the spring and summer months. 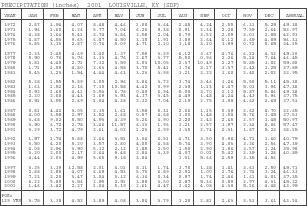 The precipitation in Louisville is nonseasonal and varies from year to year. The fall months are usually the driest. 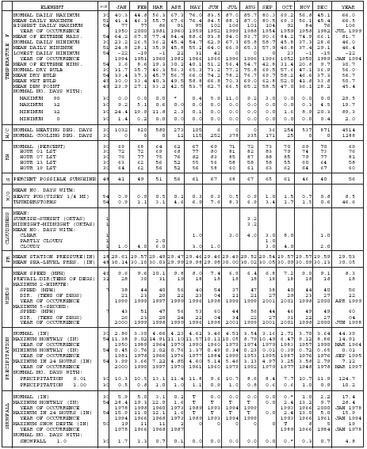 Generally, March has the most rainfall and October the least. Snowfall usually occurs from November through March. 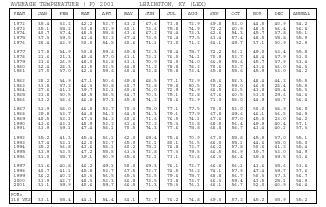 As with rainfall, amounts vary from year to year and month to month. 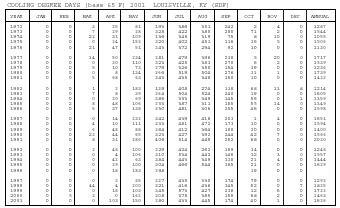 Some snow has also been recorded in the months of October and April. Mean total amounts for the months of January, February, and March are about the same with January showing a slight edge in total amount. Relative humidity remains rather high throughout the summer months. Cloud cover is about equally distributed throughout the year with the winter months showing somewhat of an increase in amount. 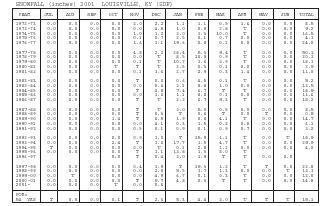 The percentage of possible sunshine at Louisville varies from month to month with the greatest amount during the summer months as a result of the decreasing sky cover during that season. Heavy fog is unusual and there is only an average of 10 days during the year with heavy fog and these occur generally in the months of September through March. The average date for the last occurrence in the spring of temperatures as low as 32 degrees is mid–April, and the first occurrence in the fall is generally in late October. The prevailing direction of the wind has a southerly component and the velocity averages under 10 mph. The strongest winds are usually associated with thunderstorms.